Not only do we stock chains and sprockets, but we also stock a full line of premium agricultural bearings. 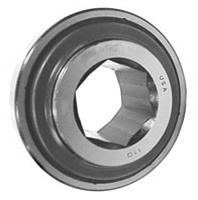 Most commonly in agricultural applications, a hex-style bearing is used. The below chart shows the standard in-stock hex shaft bearings. The next most popular type of bearing used for agricultural equipment is what is known as a tapered roller bearing. This style of bearings is so popular because it offers high load capabilities and extreme durability. Additionally, we supply mounted pillow block bearings in 2-bolt, 4-bolt, and specialty configurations right off the shelf! Our mounted bearings are manufactured using a high-precision insert with a solid housing for the best durability and performance. Then lastly we can supply standard ball bearings. Ball bearings are in stock with metal shields, rubber seals, or as open designs. Typically with agricultural applications, you want to use rubber sealed or metal shielded bearings to keep dirt and content out of the bearing. To get a quote on agrocultural bearings give us a call, email sales@usarollerchain.com, or simply fill out the below request form and someone from our customer service team will contact you.